Have you ever driven past a commercial building as a forklift buzzed around and thought about how handy they must be and what you could do with one of those amazing machines if you just had it for an afternoon? KST can bring along our forklift to offload ourselves or another truck on site. We can offload to pallets of brick in the city or sort material just where you'd like. What can you move with forklift? Pretty much anything that’s pallet loaded and even items that aren’t that can be laid across the forks. Concrete blocks, brick, sod, appliances, industrial materials, and just about any material that can be stacked can be moved with a forklift – even stacks of pallets. The versatile machines are also handy for when you’re moving and need to get heavy items out of the building and into the trucks. Cross deck reach – we can reach across all decks for the full length of the trailer. No need to reposition the truck to complete offloading. Off road capabilities – our forklifts aren’t confined to just being used on concrete and asphalt – they can go off road, too. If you need pallets of sod or landscaping timbers moved around your yard, don’t attempt it by hand – use a forklift. 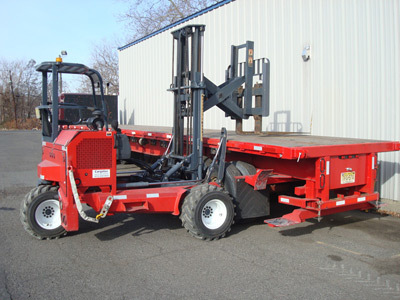 Kelly Springfield Trucking services the New York, New Jersey, Connecticut, and Pennsylvania metro areas and can deliver our forklifts to your jobsite, business, or home on a 42’ or 36’ trailer featuring air-ride suspension.